As you can see, Nougat is still on the rise, and most earlier versions ticked downward just a bit. That's not surprising as some of the most popular Android phones are still shipping with Nougat. As Samsung gets around to pushing Oreo to its devices, the Oreo numbers will probably rise faster. 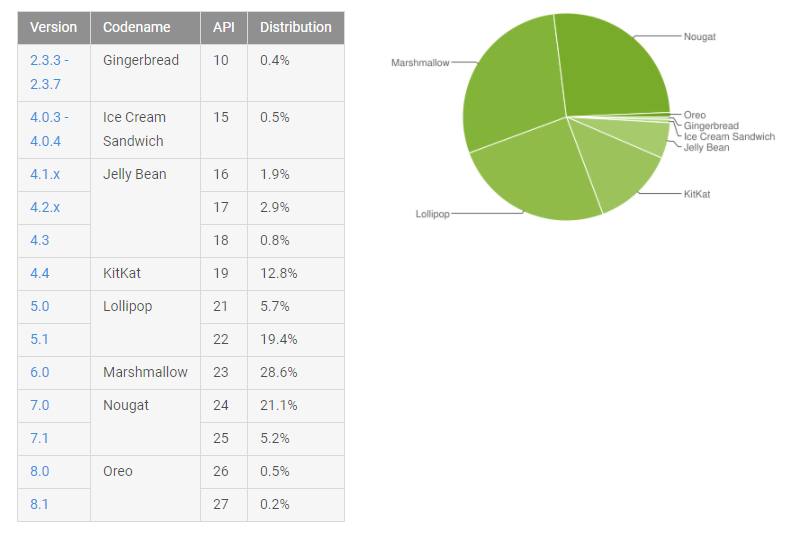 Gingerbread and ICS are stubbornly hanging on, though. Android 8.1 started hitting devices late last year, but it didn't appear in the December report. Now, it has popped up at 0.2%. Combined, Oreo has 0.7% usage right now. However, 8.0 is flat because so many Oreo devices are just moving from 8.0 to 8.1. These numbers are identical to Nougat at this time last year—it was 0.5% for 7.0 and 0.2% for 7.1. If the trend holds, Oreo should cross 1% next month and break 10% by early summer.